DIRECT BAY FRONT UNIT WITH HUGE SUN DECK. THIS IS AN END UNIT, SO IT ALSO HAS A SIDE BALCONY OFF THE DINING AREA. THERE ARE GREAT BAY AND INTERCOASTAL WATERWAY VIEWS FROM THE LIVING ROOM, DINING ROOM, KITCHEN, MASTER BEDROOM AND FLORIDA ROOM. YOU ALSO HAVE A GREAT POOL VIEW FROM THE HUGE 450 SQ. FT. SUN DECK AND FLORIDA ROOM. YOU HAVE A RESERVED UNDER BUILDING PARKING SPACE AND THERE IS A PRIVATE STORAGE CLOSET IN THE PARKING GARAGE AREA. THERE IS AN ELEVATOR FROM GROUND LEVEL TO YOUR FLOOR. IT IS ONLY ONE HALF MILE TO BEAUTIFUL ENGLEWOOD PUBLIC BEACH AND A SIMILAR DISTANCE TO BEACH SHOPPING, A CONVENIENCE STORE, SEVERAL GOOD RESTAURANTS, WATERCRAFT RENTALS AND LIVE ENTERTAINMENT. 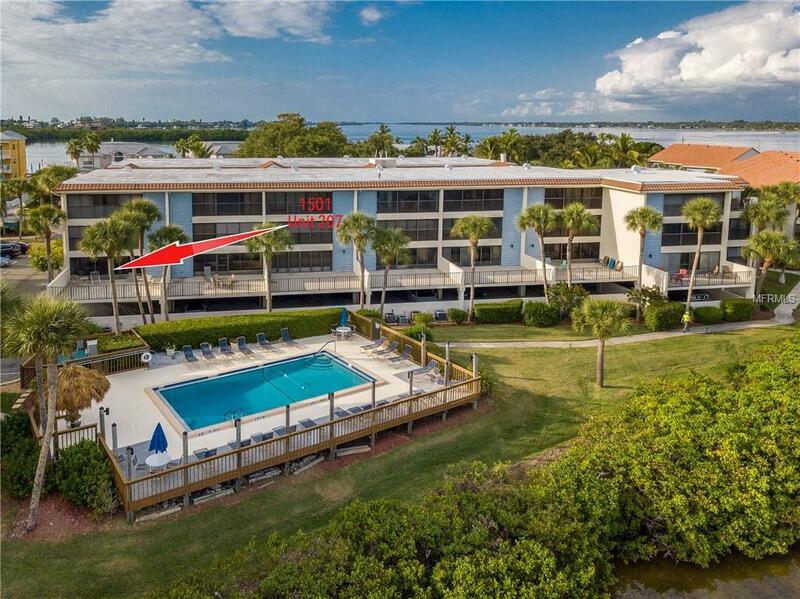 IF YOU ARE A BOATER, THERE ARE 60 PRIVATELY OWNED BOAT DOCKS AT THE SANDPIPER KEY YACHT CLUB, ACROSS BEACH ROAD FROM SANDPIPER KEY CONDOMINIUMS. THERE ARE NORMALLY DOCKS AVAILABLE TO PURCHASE OR RENT. THIS UNIT IS READY TO UPDATE TO A NEW OWNER'S TASTES. ALL MEASUREMENTS ARE APPROXIMATE. Additional Lease Restrictions Renters May Not Have A Pet. Pet Restrictions Only Owners Can Have A Pet. Must Be On Leash When Out Of Your Unit. Must Pick Up After Pet And Dispose Of Waste in Designated Location.